Everyone keeps asking me, “Which Feral’s book is next? ?” Today I’m going to tell you. First let me explain that I’m plotting the next three books in the Feral Warriors series simultaneously. Like usual, the main romance of each will be resolved in that book. But also as usual, the external plot will continue from book to book, and the action of the next three books promises to be intense, continuing the story arc that began with the arrival of the new Ferals. The other thing I keep hearing from readers lately is, “Please let the next book be Wulfe’s!” If you’ve been reading the series, then you know I’ve been setting up Wulfe’s story. Wulfe is such a sweetheart, and yet so badly scarred, both inside and out. That Feral needs a happily-ever-after. And he’ll get one. Wulfe’s story arc will be increasingly important to the overall plot of these next three books. But, as such, it won’t be wrapped up in book 7. Or even book 8. Rest assured, I have wild things planned for all three of these Ferals! Wulfe, especially. You’ll get to know more and more about him in the next couple of books. So stay tuned for book 7, Fox’s book, in late 2012. In the meantime, you might want to give my Esri series for Nocturne a try. It’s about the invasion of Washington, D.C. by the Esri, the creatures at the heart of the legends of fairies and elves — the man-sized, malicious beings who’ve been locked out of our world for fifteen hundred years and have only just discovered their way back in. Their mission? To enslave the human race. And only a handful of humans who can’t be enchanted have any chance of stopping them…if they realize what’s going on in time. My first two Esri books, The Dark Gate and Dark Deceiver, came out a few years ago and are only available in e-version or as used books, though you should be able to get your hands on them. I’ve posted excerpts of each on my website. The last two in the series, A Warrior’s Desire and Warrior Rising, will be out the end of January and March, respectively. You’ll find more info on the Coming Next page of my website. That’s all the news for now! It’s time for me to return to my writing cave. The Ferals — Fox, Grizz, and Wulfe, in particular — are waiting. 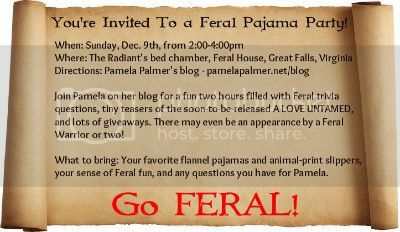 This entry was posted in The Feral Warriors and tagged Hero, The Feral Warriors, Book 7 on December 1, 2011 by Pamela Palmer. I’ve been waiting for this day with as much anticipation as a lot of you have, which might seem kind of odd. After all, I’ve read the book. More than read it. I wrote it. You know that anticipation you feel when you’ve bought…or even better, made…what you hope is the perfect gift for someone very, very special? You’ve spent hours thinking about this gift, searching for it or working on it, wrapping it up prettily. And now you’re on pins and needles, waiting for them to open it, hoping they like it as much as you think they will. Release day for an author is just like that. It’s filled with anticipation, joy, and yes, a touch of nerves. Just a touch because, so far, the reviewers are loving Ecstasy Untamed. And I’m breathing so much easier. The thing is, I never know if the book I’ve written is any good. Never. My mom doesn’t get this. “How can you not know?” But I can’t. Certainly not right after I’ve written it. I’m way too close. And think about it–I’m seeing scenes, hearing dialogue, feeling emotions. But I have to distill all that into words–words you take into your brain and transform into pictures and action and emotions. Did it work? Only you know. Writing often feels like sculpting in the dark to me. That’s why I work with two critique partners, trusted writer friends who read everything I write, even before my editor sees it. They’re my first set of eyes. They see clearly where my sculpture needs a little more work or a little smoothing of rough edges. My editor is my second. You’re my third, and the ones who really matter, because it’s for you that I write. So let me know if you enjoy the book. And if you do enjoy it, let others know, too, please? Word of mouth is everything when it comes to books. This entry was posted in The Writing Life, The Feral Warriors and tagged Ecstasy Untamed, release day on October 25, 2011 by Pamela Palmer.